For all my ardent followers!! Please note – this tale also appears in my newest blog claycookers.wordpress.com Brunyfire is using this latest site to promote only those stories that feature open hearth gastronomy stories, but still related to Bruny Island. However, the Bruny stories will still occur on this site, but the new site gives me a better format for the photographs and a cleaner design. Brunyfire and Co decided to take a day off from chainsawing, raking, burning, log-stacking, wood splitting, building the greenhouse and making the under-croft secure from quolls at their Bruny shack. 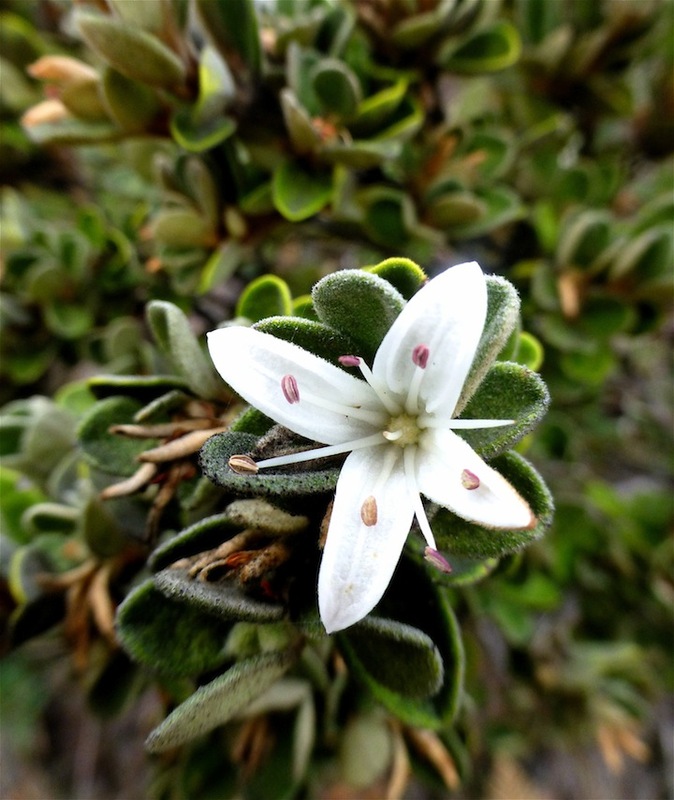 Instead, inspired by Sam’s Mutton Bird story on his blog Island Menu, we walked the Cape Queen Elizabeth track – no mean feat for a couple of old codgers! (Note: this is a 3hour, 12 km round trip so take water). 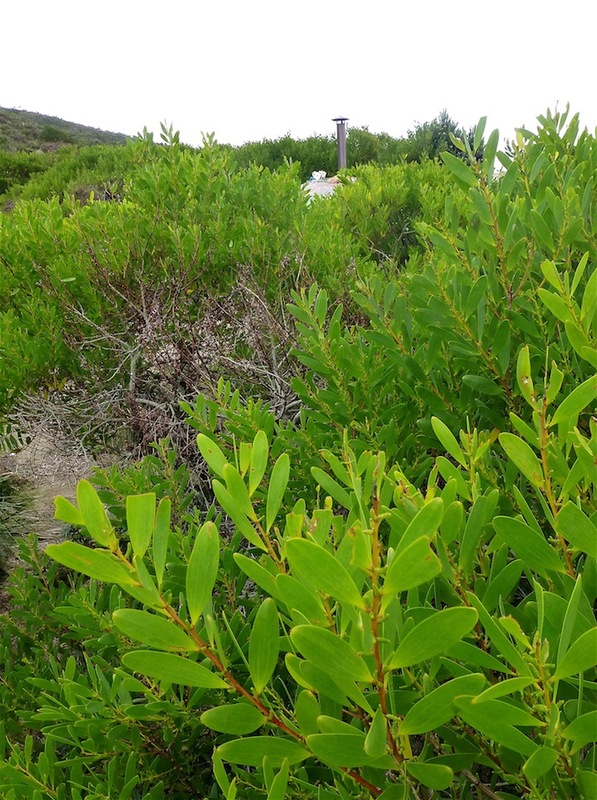 The track starts from the carpark off the main road and runs next to Erhard’s farm where his huge porkers were rooting up the ground with pigish pleasure – the track is wide and well maintained, with thick bush on either side and runs between Big and Little Lagoon. 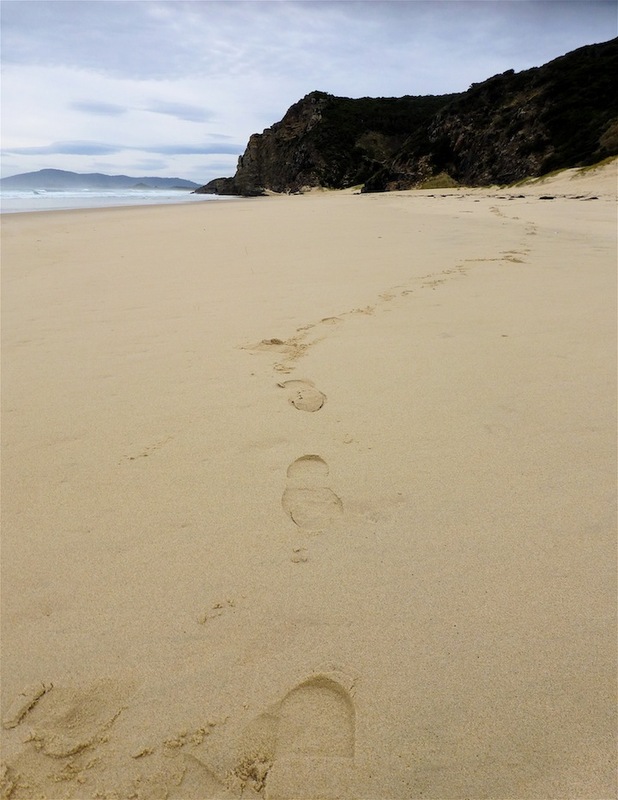 We headed straight for the beach, as Brunyfire was keen to find the elusive ‘birder’s’ hut that Sam had referred to in his story and kindly given me the directions for. At Neck Beach, and looking further south towards the isthmus and the far end of Adventure Bay, we could see we were the sole occupants. The sea was pretty wild and the tide was high at Mars Bluff to our north so there was no other option than to back track and climb the bluff track to get to Miles Beach. This is a steep and narrow track through coastal heath – hard on the heels going up and crushing the toes and the knees on the descent but worth it for the views. A final descent through scrub, down some wooden steps, into the dunes and finally onto Miles Beach. After thrashing around in the undergrowth, and almost giving up, I finally discover the real star of the trek – the little hut – The Leather Goblet. 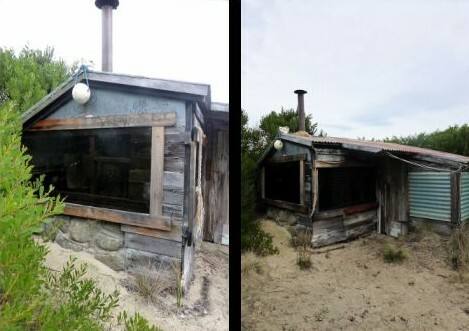 This little shack has an intriguing history that started back in the 1950s with five young men who were all good mates, enjoyed the grand tradition of home brewing, playing the odd hand of poker and a spot of hunting and foraging on Bruny Island. According to Wilf Elvey (now in his late 70s) he and Brian ‘Gerry’ Reid (or Gerry – who died in 2005 ) would often go on hikes and hunting expeditions together, and so it was that they found their way onto Miles Beach in Moorina Bay. On this occasion, they chanced upon some salvaged wreckage from the Swift, a wooden ketch that had been carrying a cargo of timber from Adventure Bay to Hobart, and had foundered off Cape Queen Elizabeth in 1935. Gerry was the carpenter, and with three other mates, Villy Bartholmeu, Wally Mainsbraidge and Don Cameron, they dragged up timber from the beach, carried in tin over Mars Bluff for the walls and the roof and, over the years, (over the Bluff and on their shoulders) four wood fired ovens. According to Wilf, they ate anything that moved – trout from the lagoons, salmon and kelpies caught off the rocks, mutton birds and even (black) swan – so the story goes. This tale however, is not only dedicated to these likely lads of a bygone time, but also to the mutton bird – or Yolla – a vital part of Tasmanian Aboriginal history and culture. These creatures, their correct title being the Short-Tailed Shearwater (Puffinus tenuirostris) or the Tasmanian Muttonbird, are a symbol of endurance for the indigenous Tasmanians. Not only are they a link with the present, when dozens of Tasmanians, Elders and the young, gather to go ‘birding’ on some of the Bass Strait islands, but this tradition ties them to their past. Despite the enslavement of many Aboriginal women folk to whalers in the dark days of Tasmania’s colonial history during the 1800s, mutton birding was just one of the practices the women maintained and so it continues to this day. Brunyfire was fortunate to obtain a couple of plucked birds – these need to be cooked outdoors as they can really stink the place out. (Note: a plucked bird is one that still has the fat intact, whereas a ‘skun’ bird, is one with the fat removed). A recipe was sourced from Jean-Paul Bruneteau‘s book Tukka: Real Australian Food. 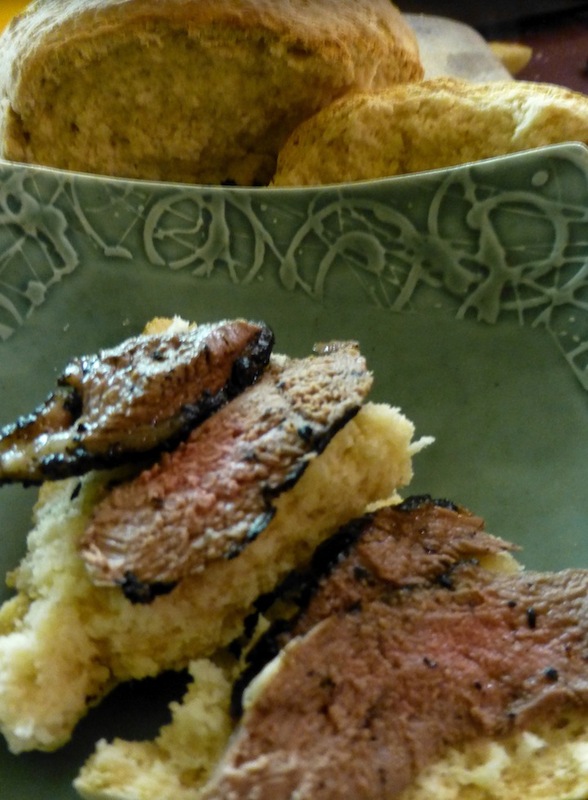 We had tried mutton bird once before in the 70s and were not impressed, so this time, Brunyfire thought it best to marinate the birds first, which is what Bruneteau recommended – if you really want to try this for yourselves, then check out the recipe! 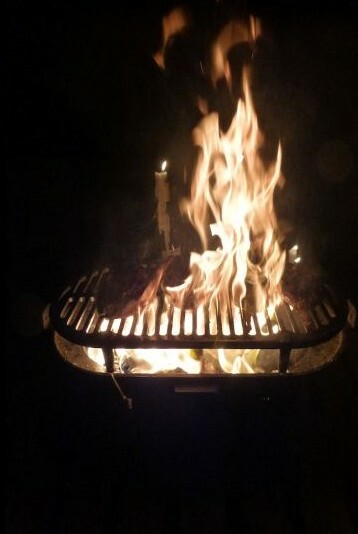 So having marinated and drained them, the birds were placed on a hot hibachi grill outside for about 5-6 minutes…… ………where they flambed up a storm!! The birds were then rested for about 10 minutes before finely slicing up the meat from the breast and served up on hot, straight out of the oven, traditional pioneer style damper. This recipe comes from Anne Gollan’s The Tradition of Australian Cooking. It is said of mutton bird that one either loves or hates the taste. I’m afraid we’re in the latter category……..
A PostScript: Mutton Birds have been hard to source over the past few years, and this is a deeply distressing situation if the problem is related to climate change or over harvesting or pollution. 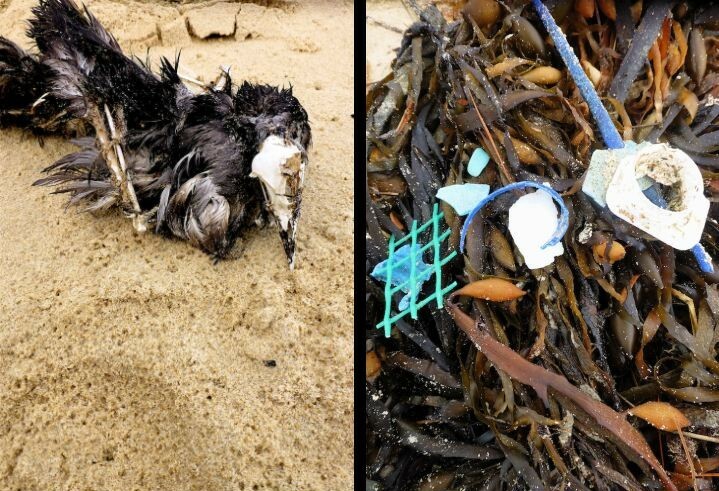 These birds have an incredible migration path and exhausted and starved birds are often washed up on the beaches of Japan, the Aleution Islands, North America and Australia – as has been the case recently. The birds travel about 15 000 kilometres in each direction annually and have been known to have flown this distance in six weeks. The only mutton birds Brunyfire saw during this trek were dead ones – which – to be fair, could just be the course of nature. 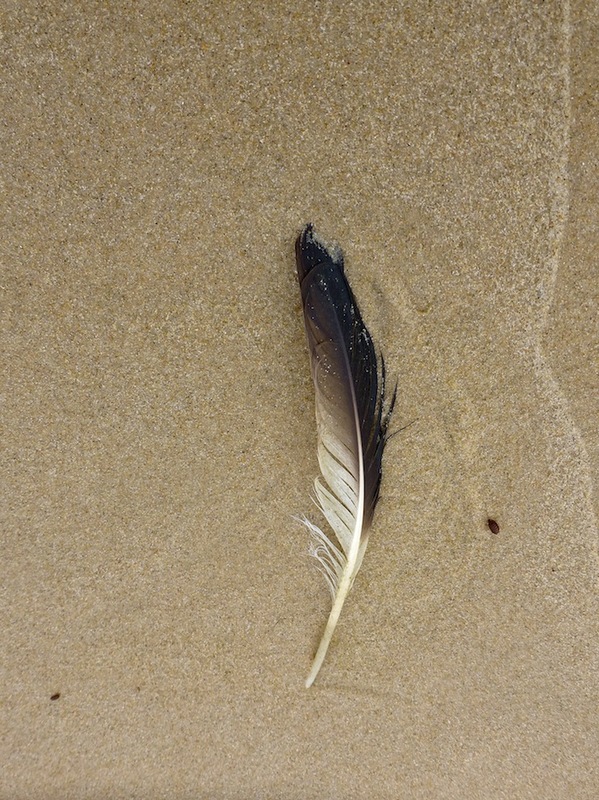 However, with the amount of fine man-made debris that is to be found on most of our beaches these days, one can’t help wondering just how much of this junk gets into the bird’s system……..
………..a timely reminder to start taking a lot more care of this place………..